Windows 8 - it's here! Sort of! Launching the Windows 8 Consumer Preview today, Microsoft's Steven Sinofsky talked about the hardware on show at MWC 2012, complaining that there are too many choices to make in tech today. "As exciting as all these devices are, we all face a bit of a yearning for something a little bit better," he said at the launch event. "In our day to day lives we face too many choices – between consumption and productivity, more battery life or more features. You have to choose do you want a touch interface or a keyboard and mouse – mixing those is complicated and not yet natural." So what's the answer, Steven Sinofsky? Why it's Windows 8, of course. "The goal should really be that the operating system scales with you; and that's what we mean by a no compromise experience," he explained. "Our goal for Windows 8 was to create that no-compromise experience with phones, laptops, desktops and tablets all coming together, to be seamless." 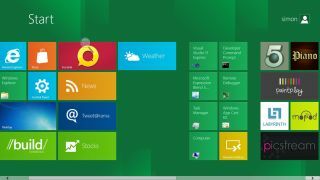 Happily for those of us paralysed by indecision in today's technological playground, Windows 8 Consumer Preview launches today.